The shredded cheese is the perfect complement to the green beans in this delicious cheesy quiche recipe. Crispy flaky pastry with a gooey cheese centre is the perfect quiche recipe for a cool evening dinner. Whisk eggs, Miracle Whip and cheeses until well blended. Unroll pastry onto parchment-covered baking sheet. Fold edges up 1/2-inch on all sides. Pinch corners to seal and create an edge. 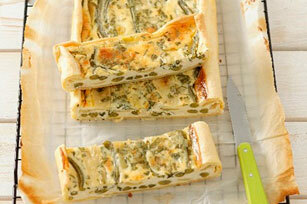 Arrange beans onto pastry; pour egg mixture on top. Bake 20 to 22 min. or until knife inserted in centre comes out clean and top is golden brown. Try using Cracker Barrel Shredded Double Cheddar Cheese instead ofTouch of Philadelphia Shredded Creamy Herb & Garlic Cheese.